The Texas FoodGuard® Certificate Examination consists of 75 questions with an additional 10 personal questions throughout the exam for security purposes. You will have 90 minutes to complete the Texas FoodGuard® Certificate Examination. You must complete the test in one session. You will need to answer all of the security questions correctly in order for your test to be valid. If you do not answer a security questions correctly your test session will be suspended. Seventy five percent or higher is a passing score on the exam. If you pass the exam, you will be able to print a certificate. If you receive a score lower than a 75%, you will not receive a certificate. 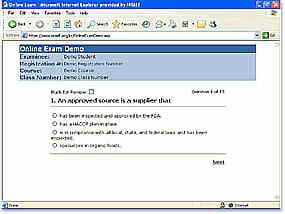 You must repurchase the exam and pass to become certified. The FoodGuard Certificate is valid in the State of Texas for 5 years from the date it is issued. However, your local health authority may require more frequent certification.